I'm continuing on with my Bettina-fest. Last post, I used Provoque as just an accent. I loved it so much that I wanted to do a full mani with it. I realized I haven't done a purple fest in a while either, so here's to both! I got a very nice email yesterday from a polish company asking if I would like to review their polish. I had heard of this brand before and knew that they only do glitters. I know a lot of you out there really love this particular brand. I'm not going to name them, but she was so nice. Anywho, I asked her if she had any polish that was not a glitter, explaining to her that I'm just not a fan of glitter. I know all of you out there who actually read my drivel knows that I love my cremes and shimmers. I felt that if I agreed to this review just to get free stuff that it would be like lying to all my peeps out there. I just knew I couldn't fairly review a polish when it's essence is something I'm just adverse to. I wonder if there are people out there who have this dilemma and yet go ahead and do the review just so they get free stuff. I'm betting there are some out there who are like this. I also know there are people out there like me, who stand by their beliefs and convictions. I wrote her back and apologized and bowed out but told her that if she ever made a creme or shimmer to let me know. Personally, I really don't do reviews. I do them for Tweezerman and Elevation Polish but for me, I don't really want to do them. I wear polish based on my mood and I feel that if I was sent a bunch of polish that I'd have to do those before what I wanted to wear. Elevation and I both have a serious case of brown polish love-she and I are polish soul mates so it's not a chore to wear her beauties. Imagine if someone sent me a case of pinks and asked me to review them? On to today's fabness. Here is the silly bottle shot. I swear I need to start doing better ones of these. This is Bettina Butterfly, Provoque and Believe. It's a purple extravaganza! I just know KarenD will love this!! I started with a full mani of Provoque. I didn't even want to do an accent nail because I am so in love with this color. It's a dusky, smoky purple creme. Here are the starting shots. Is this not gorgeous???? My camera is even playing nice and showing this as purple and not blue. Nice. Next I added lines using striping tape and Believe, which is a darker purple creme. Here is that step. 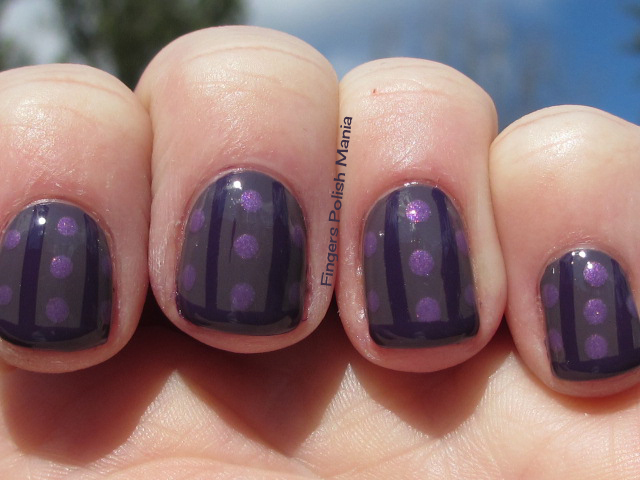 Next I added dots using Butterfly, which is a lighter purple shimmer. Here is that step. I really contemplated adding holo topcoat to this. But decided I just wanted to let the cremes shine on their own. I ended with my funky using Believe again. Here are the results. I actually really like how this came out. I caught myself staring at my nails many times while wearing this for three days. What are your thoughts about reviews and polish?